Here’s a nice bit of software for everyone to play around with. It’s a multilingual text-to-speech device. 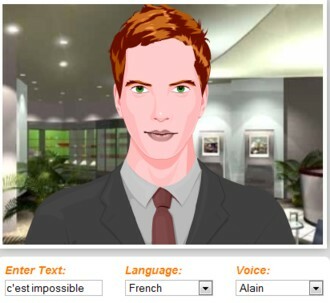 You input a piece of text, select the appropriate language from the 27 that are available, choose a ‘voice’ (male or female; there are nearly 30 different named talkers available for English, from assorted geographical locations), add an ‘effect’ if you wish, press the “Say It” button, and hey presto, listen to the result. I did some quick testing. The device seems to be sensitive to British-American differences. I tested it on the word tomato, and the BrE voice I had chosen duly came up with -ˈmɑː-, the AmE one with -ˈmeɪ-. Same with centralization: BrE -laɪˈz-, AmE -lɪˈz-. I tried it with short phrases in German and French, with good results. And all with an animated talking head! Text-to-speech synthesis seems to be making excellent progress. Nice gadget! You can hear linking-r; some US 'speakers' use flapped t's and even intrusive r's are produced by some UK avatars (e.g. Audrey). No Falkland Islanders? No, I'm just kidding. It will be interesting to see how this technology advances in the future. Hi! Great a tool as it is, I think it still lacks intonational nuances. I entered what could be taken as a "leading dependent element" (Wells, 2006, p. 69), typically realized with a non-fall tone, and the machine invariably said it with a fall. I understand that in order for the appropriate intonation to be rendered, probably more information should be entered, e.g. contextual info. Can it be done at present or do we still have to wait for more progress until we can get the machine to do something of the sort? Of course these programs are of great help, but I'm raising this issue with my EFL context in mind. However, it is sensitive to yes-no and wh- questions, the former typically realized with a non-fall and the latter, with a fall. Good for SitePal!